August 8, 2016 - What do Slugger, sliced bread and stinky feet have in common? They all were part of the Sliced Bread street festival Saturday in downtown Chillicothe. The "stinky feet" element came in the form of kid rocker Jim Cosgrove (aka Mr. Stinky Feet) who entertained a large crowd at Silver Moon Plaza. The day included dozens of vendors, a women's barbershop chorus, storyteller Shelly Long, Magician Eric Vaughn, an appearance by KC Royals mascot Slugger and free samples of sliced bread. Grand River Historical Society provided a 1938 bread slicer and demonstrated how bread would have been sliced in 1928 when commercially sliced bread was introduced to the buying public just a few blocks south of downtown Chillicothe. 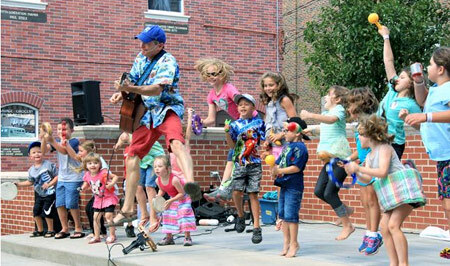 CAPTION: Mr. Stinky Feet, also known as Jim Cosgrove, entertains children with songs during Sliced Bread Saturday. August 3, 2016 - The third annual Sliced Bread Saturday Street Fair and Festival kicks off on Friday and lasts through Saturday afternoon. "This is our third annual Sliced Bread Saturday Street Fair and Festival," Main Street Chillicothe Director, Micah Landes said. 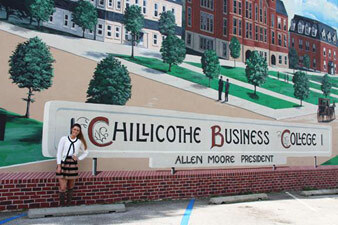 "We are excited to offer two days of fun downtown celebrating Chillicothe's heritage." 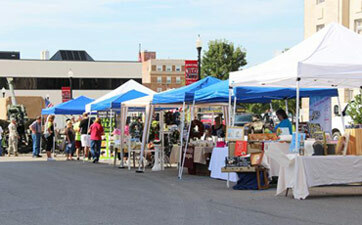 On Friday, food and craft vendors will be set up from 3 p.m. to 8 p.m. downtown. On Friday night at 6 p.m., professional chalk artist, Joan Finn will give a demonstration on the corner of Locust and Jackson, and the last Tunes Under the Moon concert of the summer will take place at Silver Moon Plaza at 7 p.m. and will feature the band School of Rock. Jersey's Sports Bar and Grill will provide a cash bar at the concert. Saturday there will be tons of entertainment set up downtown starting at 8 a.m. There will be vendors, games and a bounce house set up. The bread contest and Farmer's Market also start at 8 a.m. Registration for the bread contest will take place from 8 a.m. to 11 a.m. and judging will be from 11 a.m. to noon. At 9 a.m. the Grand River Harmony Chorus will perform in Silver Moon Plaza and the chalk walk will begin. At 10 a.m. Shelly Long, Storyteller, will begin her performance in Silver Moon Plaza. At 11 a.m. the magician, Eric Vaughn will perform and at 12 p.m. Mr. Stinky Feet will perform in Silver Moon Plaza as well. At 1 p.m. the bread / chalk winners will be announced. At 1:30 p.m. the Art Guild will host an "Art Adventure" at the Cultural Corner. At this event, children will be able to paint on canvases, color, decorate masks and even take part in creating a mural. At 3 p.m. Mr. Stinky Feet will perform again, at the library. The Kansas City Royals mascot, Slugger, will also be there from 8:45 a.m. to 9:45 a.m. for pictures. To receive updates on the event, follow the link to the Facebook event: https://www.facebook.com/events/132642200458074/. The Sliced Bread Saturday event was held this weekend. There was something for everyone with the prime attractions being the mural tours with live actors / actresses, venders displaying their goods, and a bread baking contest. The Home of Sliced Bread Baking Contest will take place Saturday, August 1, in downtown Chillicothe as a part of Sliced Bread Saturday. To register, drop off bread inside the courthouse between 8 a.m. and noon on Saturday. There is no fee to register. Judging will take place from 11:30 a.m. until 1 p.m., and the winners will be announced live in Silver Moon Plaza at 1:30 p.m. Winners receive cash prizes for the top three entries in each category with the 1st place winners receiving $100. Categories include traditional bread, sweet and quick breads and a youth category. The rules are simple; all bread must be homemade and oven-baked, arrive in a loaf form unsliced and be wrapped in plastic or in a plastic bag. "Sliced Bread Saturday celebrates our heritage and history while providing a fun, festive atmosphere for families," Supple said. Sliced Bread Saturday will take place from 8 a.m. until 2 p.m. on August 1. Most events will take place in Silver Moon Plaza and on the courthouse grounds. Some highlights planned for the day include: A Walk Through Time (A Living History Mural Tour), the children's entertainer Dino and the Dinosaurs of Kansas City, the Kansas City Zoomobile, a storyteller, magician, a children's area with inflatables, games and activities, sidewalk sales at downtown businesses, a variety of venders, food booths and the annual bread baking contest. The event is free of charge and is presented by Main Street Chillicothe and the Greater Chillicothe Visitors Region. For more information about Sliced Bread Saturday, call 660-646-4071. 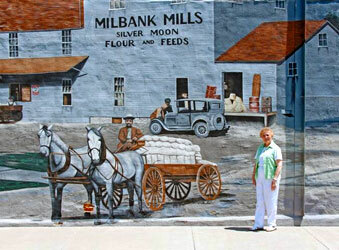 CAPTION: Pictured is Mary (Garr) Underwood in front of her personal favorite mural in Chillicothe featuring the old Milbank Mills. Mary will be a tour guide during the mural tour at the Sliced Bread Saturday event this weekend. Mary remembers many of the places featured in the murals and loves to share her personal stories of these places with tourists. The mural tours start at 8 a.m. at the courthouse and will last until 10 a.m. Call Amy for more info at 660-646-4050. The Home of Sliced Bread hosted their Annual Bread Baking Contest on August 2, 2014, as part of the Sliced Bread Saturday. A panel of judges selected the winners during a blind taste test using the criteria of appearance, texture and taste. Over $500 in prize money was shared between the winners. 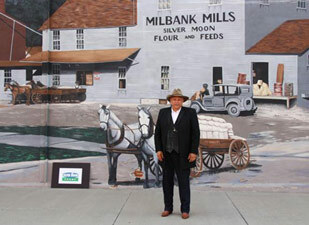 In addition to the bread baking contest, "A Walk in Time" featured seven local actors and one visiting actor dressed for the times portraying historic figures at each mural informing visitors about their significance. 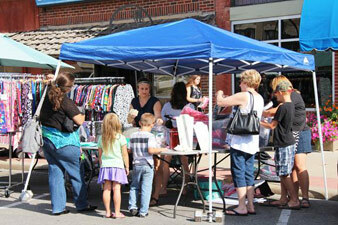 There were also 23 vendors participating with 16 merchants setting up tables for the sidewalk sale. Over 600 attended the first annual event with great weather. A bread baking contest will be part of a new festival - Sliced Bread Saturday - in downtown Chillicothe. 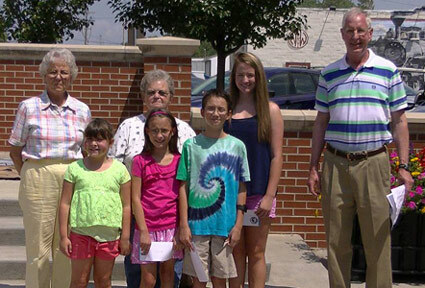 Sliced Bread Saturday celebrates Chillicothe's heritage and history while providing a fun, festive atmosphere for families. The event will take place from 8 a.m. to 1 p.m. on Saturday, August 2. Most events will take place in Silver Moon Plaza and on the Courthouse grounds. 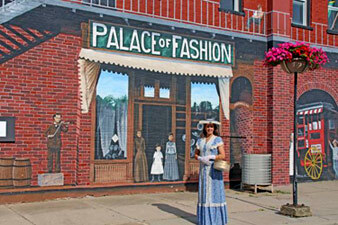 A Walk Through Time (A Living History Mural Tour) 8 to 10 a.m. Courthouse Square - bounce house, face painting 9 a.m. until 1 p.m.
Farmer's Market with special deals and sidewalk chalk art 8 a.m. until 1 p.m.
A variety of vendors on courthouse square 9 a.m. until 1 p.m. The event is free of charge and is presented by Main Street Chillicothe (660-646-4071) and the Greater Chillicothe Visitors Region.